Immediately after the birth you can take your child in the car, but only for short trips and in a safe seat. Always use the reducer as long as necessary. You can always roll up two towels for extra support and place them on the sides of your child. The safest place for your car seat is in the back (40% less chance of injury) with the backrest forward (80% less risk of injury) in the middle of the rear seat. These percentages are based on US collision statistics. In the middle, the child has the least risk of injury in the event of a collision from the side. Your backseat must be suitable for a middle position; in some smaller cars, for example, there is no suitable belt in the middle to secure the seat. The left and right sides are equally safe according to the statistics, but in regards to eye contact between you and your child, the right side will be preferred. If your child is in the front, it is important to have the backrest pointing backwards and to fasten the chair and the child very well. It is unsafe to carry your child in a travel cot in the car, a travel cot is too weak and does not offer any protection. Most prams are also not safe enough. However, there are special pram cages that are suitable for transport in the car. If you want to purchase such a container, you have to make sure that it has the ECE 44.03 mark. A booster seat or a car seat is mandatory for children up to 12 years old. You can not put your child in the front of the car if you have an airbag in the passenger seat. You do not always have to buy a new seat. Make sure that the chair is approved and see if it fits well with the weight of your child. A second-hand seat may never have been involved in an accident (even in the event of a collision) and may not be damaged. The seat should be easy for you to open, close and adjust, your child must not be able to release the clasp. The weight indication on the mark indicates better than the age of whether the seat is suitable for your child. The ECE mark is usually orange and starts with 03 (or 02). There should be no sharp parts or materials that get hot in the sun. Some seats on hot days can become very hot in a car too. The seat must be properly mounted in the car with the seatbelt. The head of your child must not rise above the backrest. In any case, place the seat on the rear seat when your car has an airbag in the passenger seat. The seat must be replaced immediately if it has been involved in a collision. This also applies if you see visible damage to the seat. Always use a seat belt, it must not be too loose. With a booster seat, the mandatory seat belt must not run too close to your child's neck. Do not change anything on the seat, as the warranty will then immediately expire. Always keep in mind the outside temperature and direct solar radiation. Never leave your child alone in the car, even in the car seat. You have to adjust the belts as soon as your child gets bigger, but also if it is wearing thicker clothes, for example a winter coat. The same applies if your child is wearing thin clothes. Tighten the belt especially around the hips. It is important to activate the child lock, your child must not open the door from the inside. 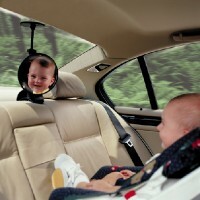 You could place a second rear view mirror, so you do not have to look around every time you want to see your child. Make sure you keep your attention on the traffic, even if the baby is crying so hard. First try to find a place where you can park the car. If you think that there is really something wrong with your child, for example that it looks like it is suffocating, stop on the emergency lane, these are there for emergencies.